Read these amazing stories from our remarkable fundraisers. See some of the different and inspiring ways people like you have raised money to support us. 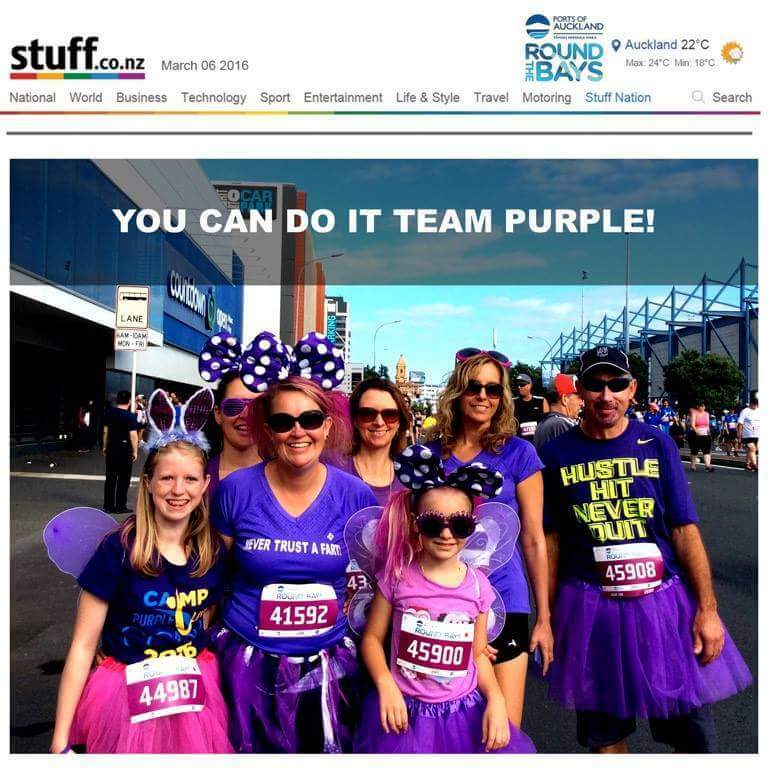 Round-the-Bays 2016 - Raising funds for Camp Purple Live! Camp Purple Live is a cause I am extremely passionate about. 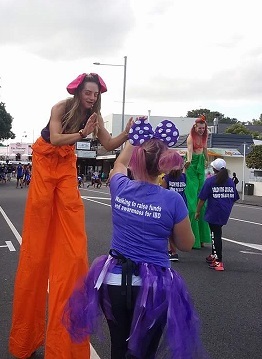 I participated in the Auckland Round the Bays in 2014 to raise funds for the very first camp and decided it was a good opportunity to raise funds and awareness again this year for the camp. The first year I did it with two friends in purple tutu’s. This year I decided to rope in more people and have them wearing as much purple as possible. The aim was to create awareness for IBD. We were certainly stopped a lot along the way and were asked many questions about IBD. It was great to have Beth turn up as she herself has been to camp twice, as a camper, and it’s fantastic to have the kids participating and raising awareness for their own camp. I am also extremely fortunate to have such wonderfully supportive people in my life who also turned up and walked with me. The plan is to encourage even more people to participate with me in the coming years so we can have a SEA OF PURPLE! Many visitors to this website are no doubt familiar with Emilia Dalton for her facebook page IBD NZ Support Buddies. 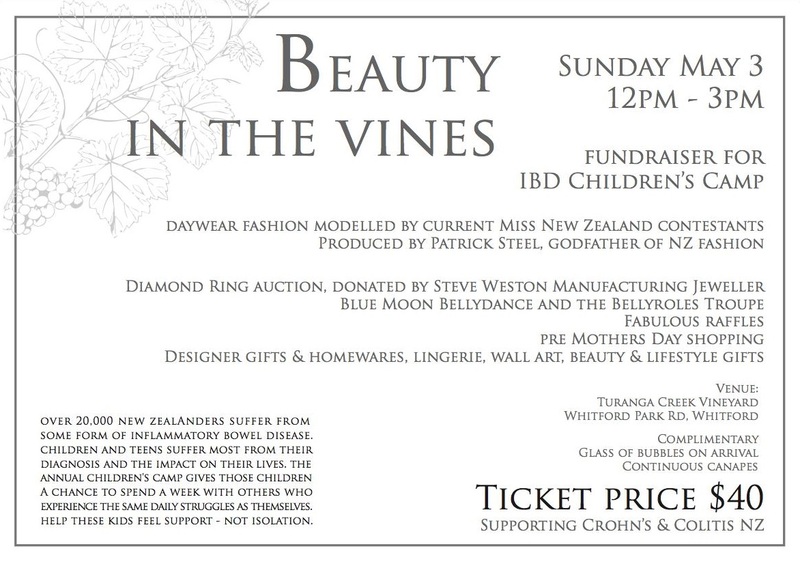 What many do not know is that, despite having been diagnosed with ulcerative colitis, she is the current title holder of Ms. New Zealand United Nation International 2015 and, this past May, organised a fundraiser for Camp Purple Live called Beauty in the Vines. It featured a fashion show, auction, and gift show, with all proceeds going to benefit the camp in January 2016. “I’d love to give back and support especially the IBD kids...in their every day struggles of living with this disease...and alleviate some of the stress that these children and their families experience. I also run a Facebook support group called IBD NZ Support Buddies! Currently we are about 229 members strong and growing! All members can access the forum any time of the day and night for support from other members experiencing the same issues. Whether it be accessing information on how to deal with particular issues but also provide a shoulder to cry on or just emotional support. Living with IBD is not easy – but hopefully I’m providing a service to make it easier on all involved”. CCNZ is eternally grateful for the support she has given to the camp as well as her commitment to support others with IBD. Original generation time 0.9849 seconds.